This year’s Mazima AGM on 28th of November 2018 at Namirembe Guest House will provide an account of where and how the money you have been saving has been stored or invested. It is a grand opportunity to interact with the other savers and to contribute effectively to the management of the Scheme. We shall have members from the regulatory body (URBRA), our Financial team will provide in details the financial and investment statements as recorded till 30th June this financial Year. It is also important to take note that you might be our next member on the Board of Trustee because we shall be voting that day. 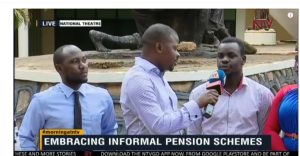 As Mazima Retirement Plan is looking to reach out to “Omuntu wa wansi”, we had an interview with NTV to discuss about the challenges that people face or hinder them to save for their retirement or why they choose to save with Mazima. A few of our savers shared their views on the platform. 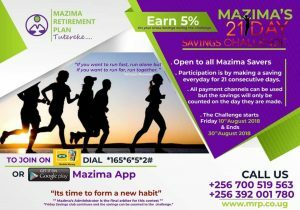 Mazima Retirement Plan has brought another yet exciting challenge!! Save everyday for 21 days any amount of money through mobile money or at our offices and stand a chance to win a 5% return on your stake after the 21 days. Reminder!!! you can now turn on your auto-save feature on mobile money to automatically save your desired amount of money on your account everyday. Based on its sustained growth over the past year, the fintech industry could experience even greater growth moving into the coming year. Financial technology targets a number of areas within the financial industry, including payments and wealth management.